Glaucoma (glaw-coma) is a condition where the fluid pressure level inside the eye is “too high” for the health of the eye’s internal structures, especially the optic nerve which can become damaged. Basically, glaucoma or elevated eye pressure occurs when the fluid (aqueous humor) that the eye normally makes (from the ciliary body) can’t drain away properly. Normal fluid production and flow are illustrated below. The trabecular tissue is nature's drain. When this tissue fails to work properly, glaucoma can occur. 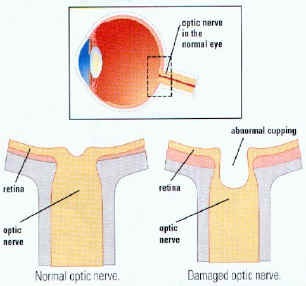 This illlustration shows the side view of a normal optic nerve cup compared to an enlarged optic cup. The cupping process represents LOSS of nerve fiber tissue inside of the optic nerve. When eye pressure rises, it slowly destroys the delicate fibers in the optic nerve that send visual messages to the brain. As nerve fibers die, the optic disc enlarges. Nerve fibers that control side vision are damaged first. Damage to the optic nerve results in vision loss, typically side vision is lost first, followed by central vision. Glaucoma is a “silent & painless” disease, which can steal a patient’s vision away without any symptoms until its too late! There are many forms of glaucoma based on the patient’s age (congenital, juvenile, adult), presentation (chronic, subacute, acute), or mechanism (open angle or closed angle). This makes diagnosing glaucoma and discussing it with patients tricky and confusing. Risk factors for glaucoma include having extreme hyperopia, diabetes, high blood pressure, prior eye injury, african-american heritage, or relatives with glaucoma. Many pieces of information must be gathered, sometimes after a few offices visits to sort out the exact type of glaucoma a patient may have. During a complete eye exam for glaucoma, specific items are checked: the eye pressure is measured with a tonometer, the optic nerve is inspected, noting its size, color, and configuration with an ophthalmoscope, the fluid drainage angle is inspected, and a visual field test is performed. 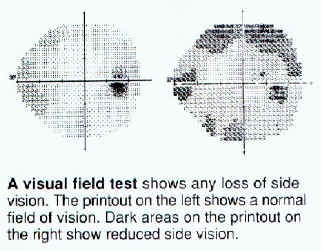 Visual field testing is a method where each eye’s entire center and side vision is determined by a very sensitive computer. If any damage from glaucoma exists, the computer will find it. A GONIOSCOPE allows Dr. Gualtieri to look at your drainage angle and drainage tissue. 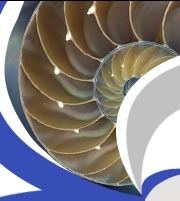 The size and configuration of the drainage angle helps determine the kind of glaucoma you have. Sometimes a patient may have a few findings suggesting glaucoma and other findings being normal. These patients are called glaucoma suspects and are monitored just as closely as a real glaucoma patient for the development of the disease. Glaucoma can’t be cured, but it can be controlled with medication, laser therapy, or surgery. Depending on the type of glaucoma, therapy typically starts with eye drops, which either help fluid drain from the eye or reduce its production. If medication fails, then laser therapy is instituted that can reduce fluid production or increases its drainage. 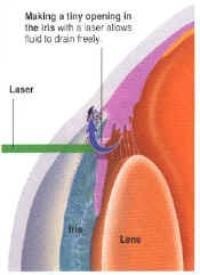 in this diagram, an argon laser beam is used to make 50 to 100 spots on the trabecular drainage tissue. This increases the tissues porous nature allowing aqueous fluid to pass through more easily, thus dropping the pressure. Laser treatment may be used in addition to current eye drop therapy or may take the place of eye drops depending on the final pressure achieved or desired. 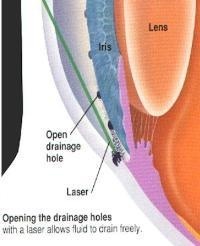 If there is narrow or angle closure glaucoma, a small hole is made with a laser in the colored iris tissue. 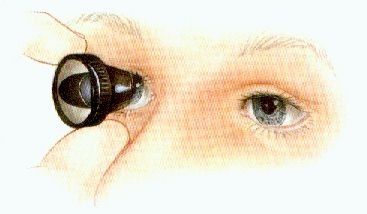 This hole acts as a "relief valve" and allows the iris to separate or move away from the angle by virture of fluid pressue equalization. Aqueous fluid then can find the trabecular drainage tissue and exit the eye easier thus reducing introcular pressure. If these two modalities fail, then conventional surgery is used to improve fluid drainage from the eye. 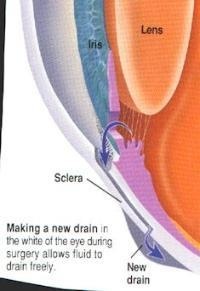 A surgically created outflow valve is fashioned out of the eye's tissue. 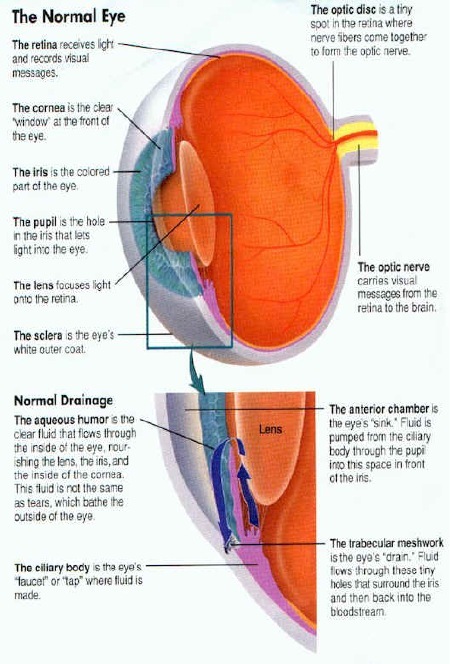 Aqueous fliud slowly drains out of the eye underneath the conjuctival tissue and then it is finally absorbed back into the body's circulation. If you have any risk factors, DO NOT DELAY, call our office at 619-688-2648 for an exam, it just may save your sight!